When Gregory Orr was twelve years old, he killed his younger brother Peter in a hunting accident. He screamed, then he cried, but he got very little help with his grief and guilt, not then, not later. His identity and his brother’s seemed eventually to merge “into a single tangle,” the two of them “inextricable” in his thoughts. 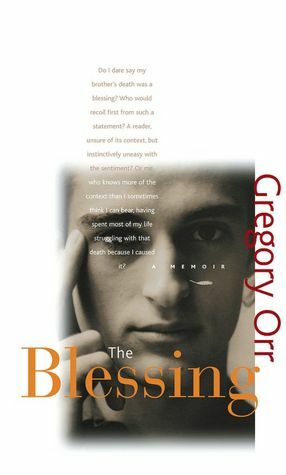 Orr tells this story in The Blessing: A Memoir, which I mentioned in my previous post. (He was speaker at the Mennonite Writer/s VI conference in Harrisonburg, Virginia.) The difficulties and shame – the mark of Cain, as he saw it – that seized his life because of this event were compounded by his mother’s unexpected death when he was fourteen and his father, who was charming but unreliable and addicted to amphetamines. Orr sought various ways through his despair, including involvement in the civil rights movement, with its potential martyrdom. This brought him no relief but nearly to the end of himself instead, and barely holding on. It was the lure of language – “the possibility of making my own paths out of language, each word put down like a luminous footstep, the sentence itself extending behind me in a white trail and, ahead of me, the dark unknown urging me to explore it” – and a kind of epiphany in a field of David Smith’s sculptures that gave him what he needed to go on. He could choose, he realized, “the artist’s kind of death” and thus know “being reborn as language.” Here the memoir ends, without satisfying our curiosity about how such a path is walked into the future, but I suspect his book Poetry as Survival says more about that. “Do I dare to say my brother’s death was a blessing?” Orr asks. The reader may recoil, he realizes, and he does too. But it’s not as pollyannish as it sounds. In French, blesser means “to wound,” and in English the word means “conferring spiritual power” but its Old English origins are bletsin, “to sprinkle with blood.” So it’s these three meanings, brought together, that take him to the heart of the violent event in his childhood and also to the question of why he was spared. I think this is a profound and useful way of thinking about blessing, especially for those who have suffered, or suffer still. We know – whether by promise or experience – that suffering can be transformative, but such transformation doesn’t ever exist, I think, without reference to the underlying wound. This entry was posted in Books and tagged David Smith, Gregory Orr, Mennonite/s Writing VI, Poetry as Survival, The Blessing by doradueck. Bookmark the permalink. I look forward to hearing your take on this book, Shirley. — So true, a process, and complex, not pat. I love that complex definition of blessing. I’ve often said that my stillborn son was one of my greatest blessings, and people always look at me funny when I do. I really appreciate your final sentence as well. I think I need to read this book. Thanks, Heather. I know from your writings what you mean when you use the word — your work is evidence of that. After seeing Orr’s definitions, I looked in my own Dictionary of Word Origins and see that the word was probably influenced by the unrelated bliss, which also explains your “look at me funny” or “recoil,” as Orr puts it. Your post reminds me of a book I have just finished reading, called Sarah’s Key, by Tatiana De Rosnay. It takes place in Paris in 1942. Sarah, a ten year-old girl, is brutally arrested with her family by the French police in the Vel’ d’Hiv’ roundup, but not before she locks her four year old brother, whom she loves dearly, in a cupboard in the family’s apartment, thinking that she will be back within a few hours. She alone survives, but lives with a burden of guilt that eventually becomes unbearable. Thanks, Elfrieda. I’ve heard so much about this book — it’s now on my “list” of books I want to read. Thanks for that definition of “blessing.” I had never thought to dig into the actual meaning before, although I’ve done it with other words. It gives it such depth. I agree; I’m so grateful for learning this from Gregory Orr, because I don’t think I’ll be able to hear the word in quite the same way again. — And great to see your blog as well! Those cinnamon buns (latest post) look beyond tempting.